Baked Italian Meatballs with ground beef and parmesan, a fantastic appetizer for any occasion. A lot healthier than the fried meatballs, but so juicy, flavourful, and as quickly to make. 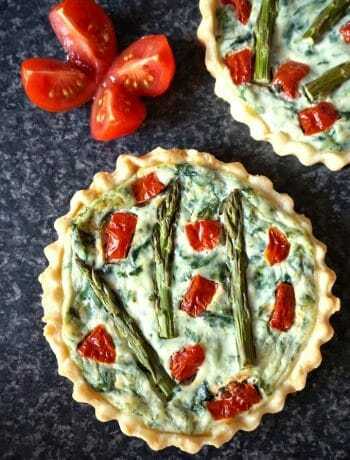 Serve them with a nice tomato sauce, or just on their own with lots of grated parmesan and fresh parsley. 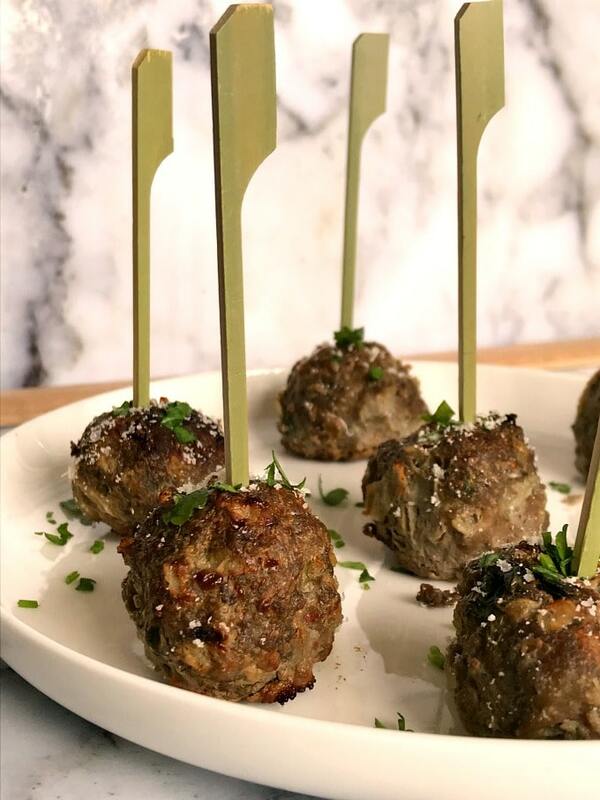 Meatballs, the most delicious bites you can ever get. From Baked Spaghetti and Meatballs, to Healthy Swedish Meatballs or Hearty Minestrone Soup with Meatballs, and the famous Romanian Meatball Soup, they make an incredibly tasty main dish. But, how about having meatballs as an appetizer? 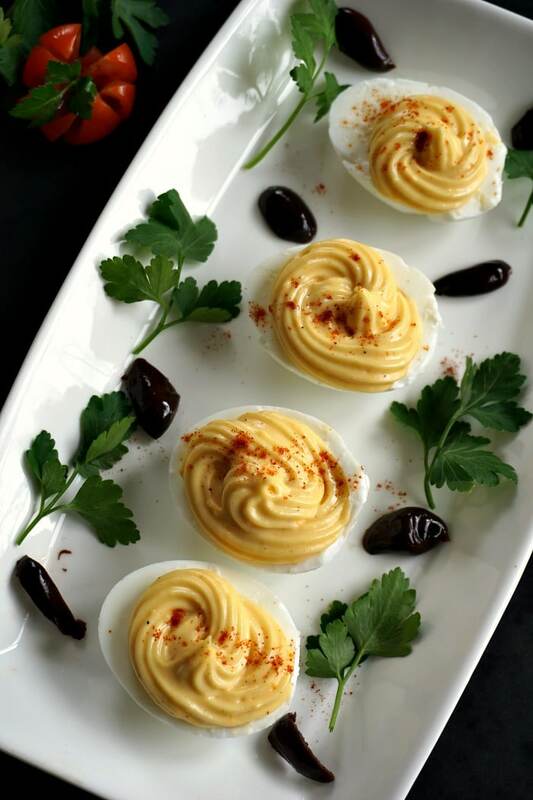 They make the perfect bite for any party, not to mention that they are so easy to make, you don’t need to worry about fancy canapes that take time and effort to make. Yes, fried meatballs are easy, but did you know that baking them is a lot easier, and they are as juicy and tasty? And bonus, which is the number one reason I go for baking, you don’t need to stink up the whole kitchen, or set your fire alarm off with all the smoke coming from the frying pan. All you have to do is throw them in a tray, and that’s it, come and get them out in about 20-25 minutes. They are absolutely gorgeous, incredibly delicious, especially hot just out of the oven. I like serving them with lots of parmesan cheese, but the good old tomato sauce is not to be missed either. If you have a party, you can either serve them in individual bowls, or or a serving plate with canapes picks to make it easier to grab them. These baked Italian meatballs are made without breadcrumbs, the secret to having juicy meatballs is using ground beef that has a bit of fat, so I don’t recommend the lean ground beef, as the meatballs might end up pretty dry in the oven. Go for at least 10-15% fat, that should do the job. Then 2-3 tablespoons of parmesan for extra taste, a finely grated onion, one egg and one or two tablespoons of freshly chopped parmesan, salt and pepper to your taste, and that’s pretty much it, delicious meatballs for a crowd. You can use a combination of ground beed and pork is you wish, there is no need to use oil for the meatballs, apart from lightly oiling the baking tray, so that they don’t stick to it. I would have a look at the meatballs half the way through the baking, I find that you don’t really need to turn them around much, they get a nice colour all the way around anyway. 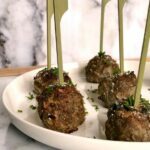 If there is too much greasy liquid in the tray, just remove that and continue baking the meatballs until they are cooked through, that will depend entirely on the quality of the ground beef. And that’s pretty much it, some seriously mouth-watering bakind Italian meatballs for all tastes. 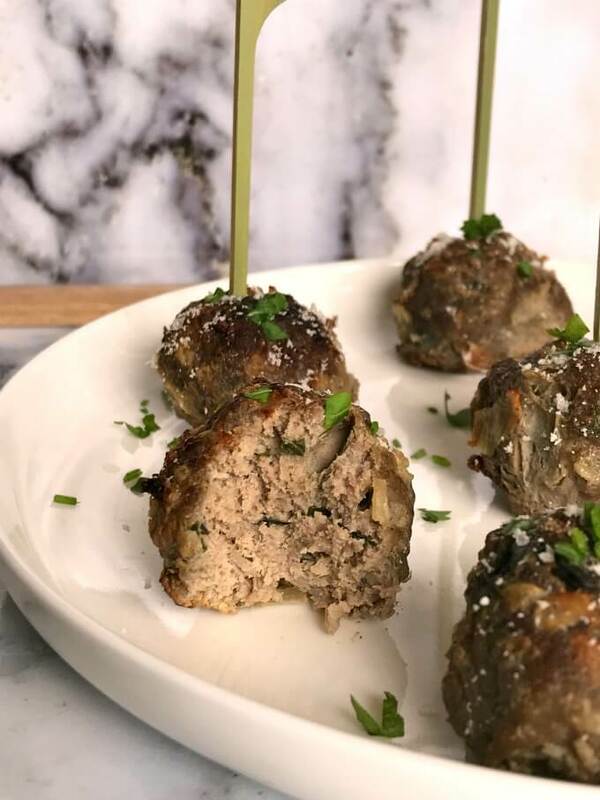 If you’ve tried this HEALTHY BAKED ITALIAN MEATBALLS or any other recipe on the blog then don’t forget to rate the recipe and let me know how you got on in the comments below, I love hearing from you! You can also FOLLOW ME on FACEBOOK, and PINTEREST to see more delicious food and what I’m getting up to. Add all the ingredients to a bowl (apart from the oil), and mix well to get a paste. Wet your hands, and shape 20 meatballs, then grease a baking tray, and arrange the meatballs onto it. Bake in the preheated oven at 220 degrees Celsius ( 428 Fahrenheit) for about 20-25 minutes or until cooked through. 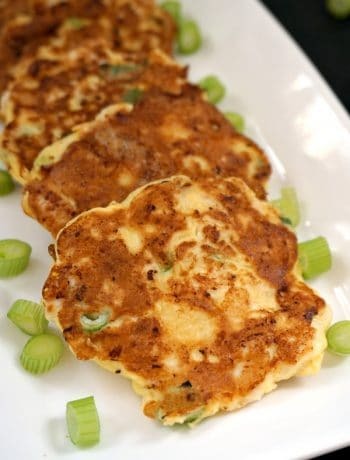 Serve with marinara sauce or just on their own with parmesan and parsley. 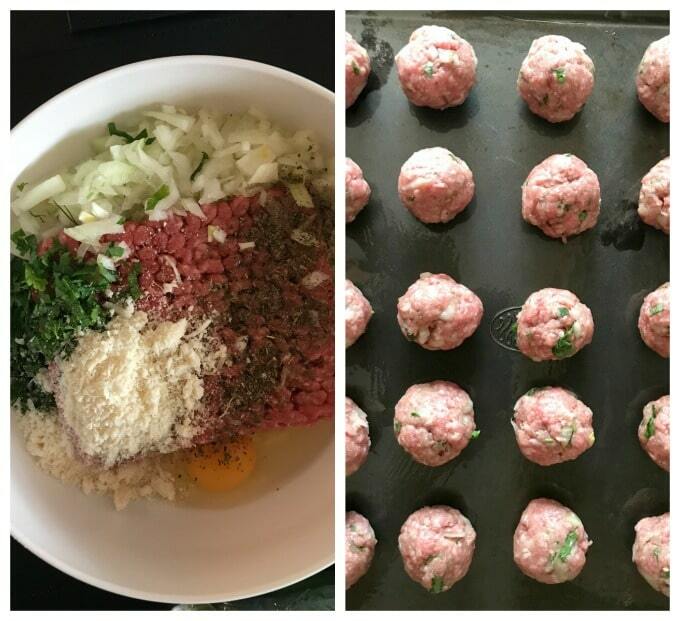 Check the post for more tips on how to make the perfect baked Italian meatballs.